From San Francisco to Las Vegas, discover some of America's most stunning national parks such as Yosemite National Park, the Grand Canyon & Monument Valley. In terms of distance, not much separates the hoodoos of Bryce Canyon, the buttes of Monument Valley and the magnificent Grand Canyon. However, as rock formations go, they couldn’t be more different. You’ll get the opportunity to explore this diversity in one compelling journey. Beautiful Yosemite National Park confirms the incredible range of wonders on offer in this corner of the United States. Combine that with cities like San Francisco, cultural gem of the West Coast, and the urban wonderland of Los Angeles and you’ll be sure to be swept away by it all. 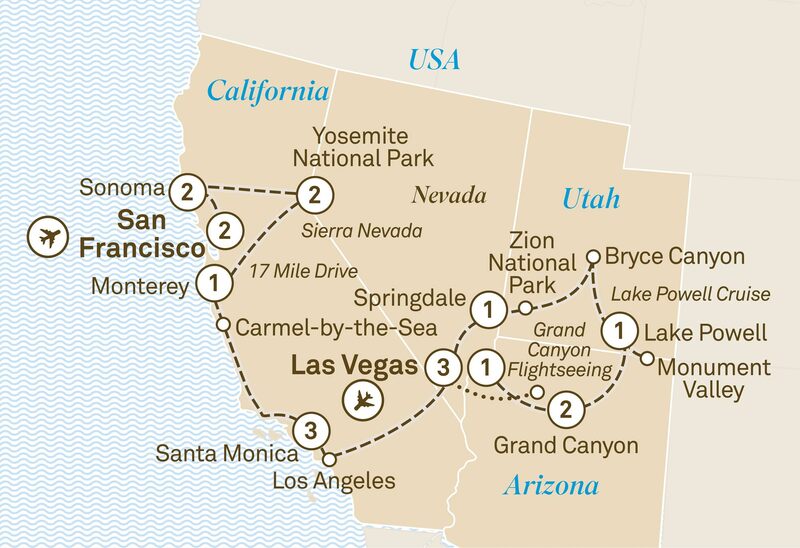 Along the way, you can also look forward to excursions in beautiful Utah and Nevada. There will be plenty of opportunities to take the scenic route. Begin your journey with a two night stay at the luxurious Fairmont San Francisco. Celebrate your adventure at a ‘Welcome to America’ dinner. Explore San Francisco on board a hop-on-hop-off bus. Head to Sonoma, stopping at Napa Valley and passing picturesque wineries and stunning redwoods enroute. Your Special Stay for the next two nights is Fairmont Sonoma, in the heart of the wine country. Take in the aromas of the beautiful Quarryhill Botanical Gardens, lovingly developed from abandoned quarries. Tour a local winery and, of course, taste the delicious produce. Travel towards the Sierra Nevada Mountain Range to the world-renowned Yosemite National Park. Tenaya Lodge will be your cosy stay for two nights while you explore the park’s wonders. Absorb the fresh air and the stunning views all around you as a park ranger on your Yosemite Valley Open Air Tram tour interprets the history, geology, plant and animal life in the region. View the park’s natural highlights – Half Dome, El Capitan, Tunnel View and, depending on the season, Yosemite and Bridalveil Falls. Explore the quaint seaside village of Carmel-by-the-Sea and meander through the café and boutique-lined street to the ivory sand beach at the end of the main street. Wind along the picturesque 17 Mile Drive en route to Monterey where canning factories once lined the waterfront street, made famous in John Steinbeck’s novel, The Grapes of Wrath. Enjoy an overnight stay at the Marriott Monterey or similar. Enjoy dinner at the fine dining restaurant located within the hotel. Drive along the picturesque California Coast to Santa Monica. Hotel Shangri-La will be your home for the next three nights. Discover the ‘city of angels’, including the Hollywood sign, and Rodeo Drive, then spot your favourite star on the Hollywood Walk of Fame. Enjoy the afternoon at leisure. Choose where to dine tonight. Spend a day at Universal Studios, or experience the magic of Disneyland. Alternatively, see the homes of Hollywood’s famous movie stars, or take a tour to Catalina Island. Revel in the glitz and glamour of Las Vegas during your three night Special Stay at the luxurious Bellagio Las Vegas in a fountain view room. Adventure awaits as you fly to the western rim of the Grand Canyon, passing over Hoover Dam, Lake Mead and the Colorado River. Stop at Eagle Point and venture onto the glass-floored Skywalk Bridge for thrilling views of the eagle-like rock formation and Grand Canyon. Round off a wonderful day with lunch at Guano Point as you admire the beauty and magnificence of one of the Seven Natural Wonders of the World. Be mesmerised by the aquatic masterpiece that is Cirque du Soleil’s ‘O’. A world-class performance of dizzying choreography and powerful gymnastics has acrobats and divers soaring above you, and synchronised swimmers submerged in water below. You too will find yourself submerged in the drama created in this tapestry of artistry, surrealism and theatrical romance. A truly breathtaking experience. Discover the diverse environments of Zion National Park, which attract a great variety of animal and bird life. Continue to Springdale for your overnight stay at Springhill Suites Marriott. Explore Bryce Canyon and learn about the forces that work to create the incredible rock formations known as ‘hoodoos’. Your sense of wonder and imagination will run wild as you find yourself amongst the largest collection of hoodoos in the world. Cruise on Lake Powell and relish an up-close view of the amazing geology of this area. Cruise by towering Navajo sandstone geological formations with stunning red and burnt orange rocks, and see Glen Canyon Dam, the second largest concrete arch dam in the United States. A truly wonderful opportunity to view nature’s beauty from a different perspective. An overnight stay at Lake Powell Resort rounds off your day of discovery. Take in jaw-dropping views of Wahweap Marina with its stunning sunsets, twinkling lights and occasional double rainbows, all set against the postcard backdrop of Tower Butte, Antelope Island and Navajo Mountain from your patio or balcony of your marina view room. Embrace the thrill and adventure of a jeep safari tour of Monument Valley, the best way to truly experience this fascinating and rugged environment. Enjoy a tasty lunch in the desert prepared by members of the Navajo Nation. Today, you will experience the true nature and culture of the place the Navajos call Tse’Bii’Ndzisgaii, meaning a special place where ‘glittering golden reflects off the rocks’. Continue to the Grand Canyon for a two night stay at Yavapai East or Grand Canyon Squire Inn. Discover the vastness and extraordinary natural beauty of the Grand Canyon. This evening, enjoy an unforgettable dinner right on the rim of this incredible natural spectacle. Cross the desert and return to the oasis of Las Vegas for one more overnight Special Stay at the Bellagio, in a fountain view room. Sadly, your wonderful journey through America’s South West ends today, but the memories will endure. On this 9 day round-trip from Las Vegas, discover the spectacular wonders of the Grand Canyon, Zion National Park, Bryce Canyon and Monument Valley.